Creation Date Friday, 15 August 2014. 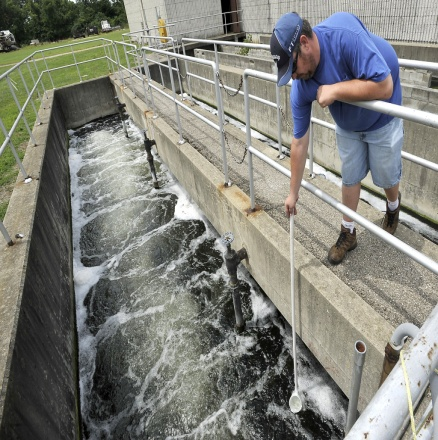 The treatment process involves different phases to improve water quality without any hazardous environmental impact. Initially, the water would be filtered to remove unnecessary grease oils, which can damage facility equipment. After the filtration process, the water would then be treated through an aeration basin to promote biochemical oxidation of wastewaters. During this stage, specific bacteria would be cultivated to consume waste in the water. As the wastewater would pass through the final ozone disinfection stage, clean water would then be discharged to Wilson’s Creek and go directly to the neighboring water trails, namely, James River and Table Rock Lake. SWCWP began its operation in 1959 with a flow capacity of 12 million gallons per day and has undergone vast improvements to follow the constantly changing demands in regulations and technology. Since then, the plant has maintained high the quality treatment of residential and industrial waste from septic tanks, restaurants and other wastewater venues. Recognizing the high demand for clean and safe water quality, Aqua Solutions is dedicated to providing scientific and industrial laboratories worldwide with high-grade purity reagent water through its array of state-of-the-art lab water purification systems. Learn more about our comprehensive line of cost-effective and high-efficiency lab-grade water filtration systems at www.aquaa.com today.